Brand new set of 2 16" X 1" Blue Max Ultra Duty .125 thick urethane band saw tires for North Tech 16" band saw. 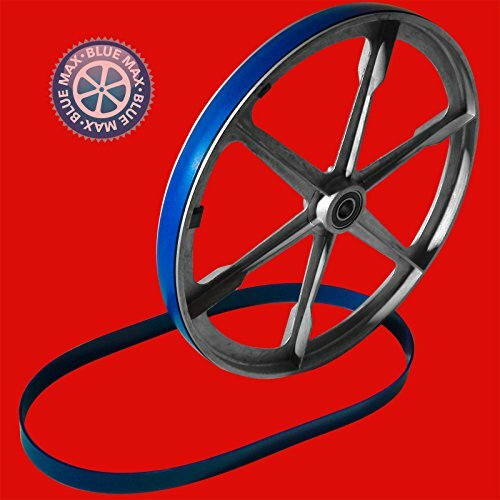 Our Blue Max UltraTM Urethane Band Saw Tires are the thickest and most advanced band saw tires available. After testing many samples we developed our own formula to make Blue Max ultra urethane specifically for band saw tire use. Blue Max tires will out perform and outlast the standard conveyor belt orange urethane everybody used in the past to make band saw tires. We have formulated the Blue Max urethane to last years longer and the surface finish of Blue Max urethane was designed to repel even more saw dust then the orange conveyor belt urethane that was not specifically designed for use as band saw tires. Blue max tires are not affected by freezing temps for those of you who may run your band saw in an unheated garage or shed. Consistent .125 thickness across the entire width of the tire for precise blade tracking... No need to damage your wheels with a screwdriver trying to stretch them on.. We include a custom installation tool and instructions with every set so you can mount the tires without removal of the wheels from you band saw and without damaging your wheels. Update your band saw with a set of new urethane tires. No messy glue needed. Brand new set of 2 16" X 1" Blue Max Ultra Duty .125 thick urethane band saw tires for North Tech 16" band saw. Update your band saw with a set of new urethane tires. No messy glue needed.